Participating in 2018’s workshop at the LSE Middle East Centre had me reflect once again on the perceived sensitives of conducting research in the Gulf states. This is especially clear when studying identity, which I pursued during my doctoral research between 2015 and 2016. My research focused on the ways in which official and popular discourses about Emirati national identity and citizenship are articulated, negotiated and performed by young Emirati citizens in Dubai, who come from diverse ethnic, tribal and cultural origins as well as legal statuses. I was in particular interested in the region’s creole past and its inhabitants’ links to, and origins from, various parts of the Indian Ocean, Yemen, Baluchistan, Southern Persia, the Arabian Gulf, and Africa (Potter, 2014), as well as the rather open citizenship policies that allowed for the naturalisation of some of these inhabitants who now constitute Emirati citizenry (Jamal, 2015). In this piece, I discuss how I decided to conduct this particular research and why it is important to study the bottom-up constructions of Gulf national identities, moving away from existing tendencies to discuss national identity through migrant lives and top-down constructions by the state. Like many other researchers, my interest in my research topic emerged from my personal experience, having lived and worked in Dubai for five years. Unlike other multicultural contexts I lived in, experiences and articulations of diversity in relation to national identity was very different in Dubai. Coming from Turkey, with its history of struggle with multi-ethnic diversity in relation to constructing a national identity, I was fascinated by what I saw in the UAE. How was such a young country able to create a well celebrated and internalised national identity by its citizens who originate from diverse backgrounds? Today, diversity in the UAE is solely attributed to migrants who, through their legal and social exclusion from the national community, have become crucial to the construction and maintenance of Emirati citizenship and national identity (Vora, 2013). 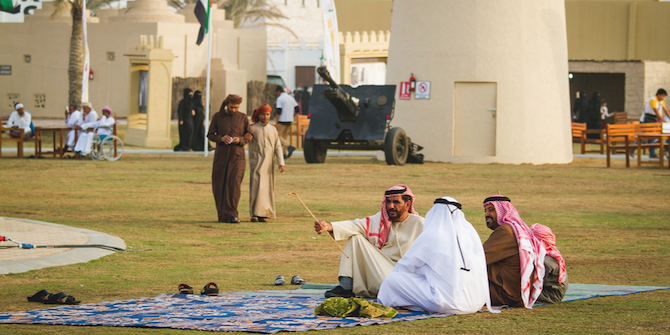 While young Emiratis primarily identify themselves through their national identity and do not perceive their communities as being ‘multicultural’, it does not change the fact that not all Emirati citizens are of Bedouin, Arab and tribal origins. The multiplicity of identities is present in the private lives of Gulf citizens, be it in the different languages they speak at home, the variety of dresses they wear in addition to their national dresses, the music they listen to, as well as the way they celebrate at weddings. Yet, the silence around these multiple identities is not only conspicuous by their absence in the literature but also in the everyday public lives of Emiratis. The tendency to treat the Gulf as a sociological exception makes this part of the world an understudied sociological context. There are various reasons why this region is understudied. First of all, as Alshawi and Gardner suggest (2013:47), in the last century this part of the world ‘were somehow insular and closed societies and therefore it was difficult to study them through anthropological methods’. While some of the cities, such as Dubai, have become international hubs today, studying their native populations still remains a sensitive project. This is reflected in the majority of historical and empirical data from this region which fall short of challenging the dominant narratives of the state because of the potential political controversy they are able to stir (al-Dailami, 2014:315). Secondly, the UAE, like the rest of the Arab Gulf states, uses the historical ‘orientalist’ depictions of the region to define Emirati citizens to the world, portraying Bedouin Arabs as the original and ‘authentic’ inhabitants (Hawker, 2011). This in turn reproduces the idea that these societies are relatively homogenous, making them less appealing for researchers, until now (Alshawi and Gardner, 2013). Third, in contrast to the salient distinction between Emirati and non-Emirati, internal differences among Emiratis are not easily visible to foreigners (see Nagy, 2006:128 for a similar argument in Qatar). Since nationality takes priority in social interactions, rarely is there reason to offer further details of one’s social identity. In any case, interactions between citizens and non-citizens are often limited since these groups tend to socialise, school and work separately (Nagy, 2006; Vora, 2013). Lastly, rentier theories dominate the analysis of the state–society relations in the region. The rentier framework argues that political stability and social cohesion are achieved through exemption of tax and vast welfare benefits allocated to citizens (Ross, 2012). However, the social contracts that Gulf citizens have with their governments are not static and have been going through changes in the recent years (i.e through the introduction of conscription and VAT). This means the implications of national identity and what it constitutes may also change in time and take different forms and boundaries. Considering the fact that, although nationhood and nationalism are constructed from above, they cannot be understood unless also analysed from below (Hobsbawm, 1990). The Gulf literature needs more bottom up approaches to how nationalism is celebrated, internalised or challenged (al-Dailami, 2014:314). By showing the complexities of Gulf citizenry, as well as the similarities of processes of national identity construction in the UAE with other societies, we can break the tendency in academia to treat Gulf societies as exceptional sociological cases, a tendency which often leads to presenting these wealthy states as lacking history and having a ‘homogenous’ societal structure. While the exceptional demographic imbalance in the UAE, where migrants make up the majority of the population, is crucial in defining the boundaries of the nation towards non-citizens, the boundaries are similarly created, maintained and blurred within and by the members of the nation, processes that define the content of Emirati national identity. Idil Akinci holds a PhD in Migration Studies from the University of Sussex. Her research interests and experience centre around the issues of national identity, citizenship and belonging, with a focus on the Gulf States. Idil taught undergraduate courses on Political Philosophy and Sociology in Dubai, and she currently teaches at the Global Studies department of the University of Sussex.